A creamy cleanser that helps free skin of dirt and debris; gently melts off and removes makeup from face and eyes with no need to tug on delicate skin. Apply all over face. Wait 10 seconds then rinse off with water and pat dry. First step morning or evening to cleanse skin of debris. Morning can be used before day cream and makeup and can be used at night before night cream and going to bed. Ingredients: Water, Caprylic/Capric Triglyceride, Glycerin, Tridecyl Stearate, Neopentyl Glycol Dicaprylate/Dicaprate, Tridecyl Trimellitate, Stearyl Alcohol, Fragrance, Ceteareth-20, Myristyl Myristate, Glyceryl Stearate, Dimethicone, Carbomer, Citrus Medica Limonum (Lemon) Extract, Zea Mays (Corn) Oil, Retinyl Palmitate, Cholecalciferol, Retinol, Triethanolamine, Titanium Dioxide, Ascorbic Acid , Disodium EDTA, Sodium Benzoate, Methylparaben, Propylparaben, Diazolidinyl Urea, Yellow 5. Ingredients: Water, Caprylic/Capric Triglyceride, Glycerin, Stearyl Alcohol, Ceteareth-20, Ethylhexyl Palmitate, Isocetyl Stearate, Fragrance, Glyceryl Stearate, Dimethicone, Magnesium Ascorbyl Phosphate, Citrus Nobilis (Mandarin Orange) Fruit Extract, Citrus Aurantium Dulcis (Orange) Peel Extract, Carbomer, Vanilla Planifolia Fruit Extract, Titanium Dioxide, Triethanolamine, Disodium EDTA, Diazolidinyl Urea, Methylparaben, Proplyparaben, Sodium Benzoate, Red 40 Lake, Yellow 5 Lake. This meltdown duo is absolutely the best. 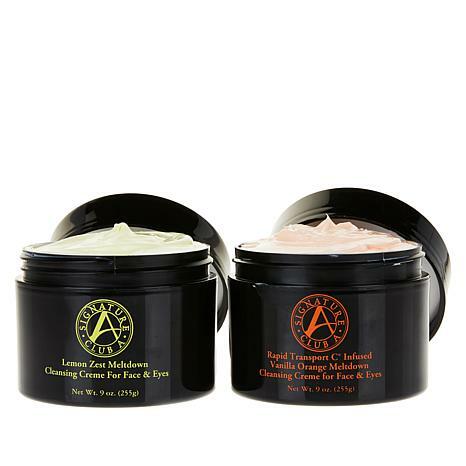 Aromatherapy in a face cleanser, plus moisturizing. 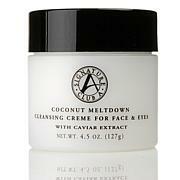 Melts away makeup in seconds. I honestly look forward to using this morning and night. What a bargain. I'm 69 going on 50. I've been usingSignature A for years, when something new comes along I may try it but I always go back to this product! Nothing works better and it's very reasonably priced. I'll never switch! I have been buying Meltdown for YEARS now! It is THE BEST makeup remover I have ever used and the only one I've found to remove water-proof mascara. It is also gentle on the skin. I've tried a variety of scents, all have an appealing odor and none have an over-bearing smell. I would HIGHLY recommend! Im 66 and tried other products that dried my face. This doesnt dry my face.